Oakland: Slow at the start of the series and strong at the end, the San Antonio Spurs beat the Golden State Warriors 94-82 on Thursday to clinch a 4-2 victory and progress to the NBA Western Conference finals. Also Thursday, the New York Knicks beat the Indiana Pacers to stay alive in their Eastern series, cutting the deficit to 3-2. San Antonio wore out Golden State the same way it has to so many other opponents. Tim Duncan had 19 points and six rebounds, Kawhi Leonard added 16 points and 10 rebounds and the Spurs held off a furious final rally. "They've got great character. They're competitive. They know there's not a million chances to do this sort of thing. 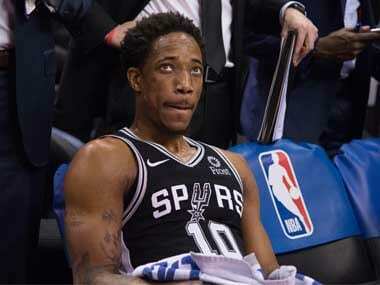 They wanted it," Spurs coach Gregg Popovich said of his squad. Tony Parker shook off a poor start to score 10 of his 13 points in the fourth quarter and Tiago Splitter added a career-playoff high 14 points for San Antonio, which had a 13-point lead in the third quarter cut to two in the final minutes. 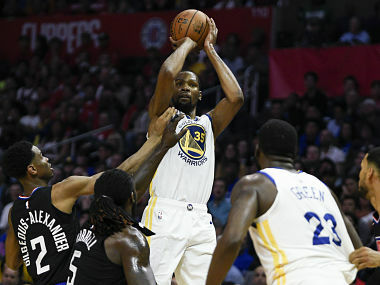 Golden State's Stephen Curry shot 10 of 25 from the floor to score 22 points on a nagging left ankle injury, and Jarrett Jack had 15 points as the Warriors finally ran out of legs. 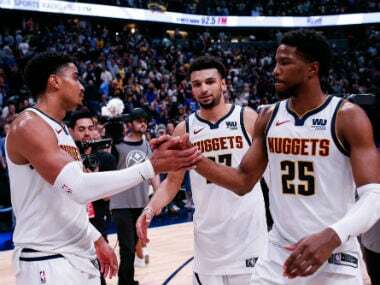 Rookie forward Harrison Barnes also suffered a head injury in the second quarter, returned in the third and was sidelined in the fourth with a headache. The Spurs outshot Golden State 45 percent to 39 percent and outrebounded them 46 to 40. Second-seeded San Antonio will open the conference finals at home against Memphis on Sunday. The fifth-seeded Grizzlies eliminated Oklahoma City in five games. 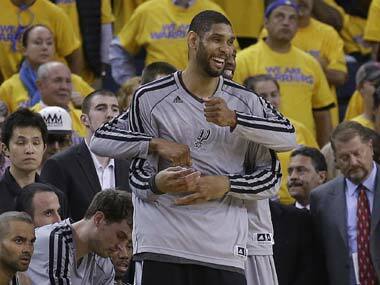 "It's going to be a rough one," Duncan said about the conference finals. "If you thought this was physical, it's going to turn up about 10 notches." The Spurs haven't been to the NBA Finals since 2007, when they won their fourth title with a sweep of Cleveland. "Everybody on the team, we all want to go one more time," Parker said. "It's been a long time." The Spurs quieted a standing-room-only crowd late in the third quarter and seemingly seized control for good. Instead, the Warriors roared back. Klay Thompson, who had 10 points on 4-for-12 shooting, made a 3-pointer early in the fourth quarter that sliced San Antonio's lead to three. Then Curry's pull-up jumper brought the Warriors within 77-75 with 4:52 to play. Parker was 1 for 13 before hitting a corner 3-pointer, and Leonard followed with two free throws to put the Spurs up by seven. Jack made a jumper and two free throws to bring the Warriors back again. Then Leonard hit another shot from beyond the arc to put the Spurs ahead 85-79. Curry and Thompson each had consecutive 3s rim out on the same possession that could've kept Golden State close. Instead Parker hit another 3-pointer to put San Antonio up 88-79 with 1:15 remaining, effectively ending the contest. "I just kept believing in me," said Parker, who added eight assists and finished 3 for 16 from the floor. "My teammates, they were behind me. They would keep telling me, 'Keep shooting, they'll go in.'" Meanwhile, New York's Carmelo Anthony scored 28 points to lead the Knicks to an 85-75 win over Indiana. Reserves J.R. Smith and Chris Copeland each had 13 points for the Knicks, who trail 3-2 and will need a victory Saturday in Indiana to force a seventh game back at Madison Square Garden on Monday. 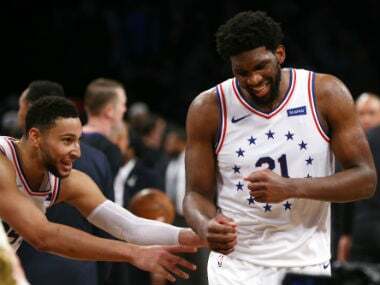 They are trying to become the ninth NBA team to overcome a 3-1 deficit to win a series. "I was totally impressed because we met the challenge," Knicks coach Mike Woodson said. "You come into games like this and you want to see who's going to step up and make plays, and we did that tonight. We were the better team in terms of doing that." "We've just got to play more solid. There's no other way to put it," Pacers coach Frank Vogel said. Vogel said Hill was hurt after a collision with Knicks center Tyson Chandler during the first half of Indiana's victory on Tuesday. Hill finished the game and scored 26 points, but experienced some headaches and showed concussion symptoms since and wasn't able to pass the league's concussion tests.